Rating: 4.9/5 based on 14 review(s). 3817 people have bought this item! very good did the job kept the door safe and clean while we had a new kitchen installed. Good quality door protectors. Quick and easy service with informative delivery. Would use again. Lightweight Door Protectors Ordered Lightweight Door Protectors online. Prompt service, quick delivery. 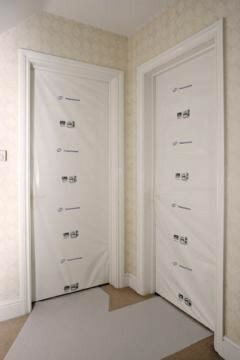 The protectors are just what we needed and totally reusable=perfect! Excellent service and quick delivery: Door sleeves did the job beautifully and are still strong enough to reuse-just perfect. Supersonic delivery of these great door sleeves. Perfect at keeping our lovely new oak doors clean as they hadnt been finished in varnish. Perfect buying experience. Excellent pricing; excellent delivery options; easy-to-use website; payment through PayPal supported. Item arrived next-day, exactly as described and in perfect order.